The Loo Hook will keep your purse, bag, or jacket close, concealed, and clean of harmful bacteria found on the bathroom floor. The Loo Hook gives you the ability to be hands free where they need to be the most: the loo, or restroom, or privy, or john, or lavatory, or however you call it. The patented universal design of The Loo Hook allows for multiple uses; if you can find an edge, it will allow you to be hands and germ free! The Loo Hook holds up to 50lbs. 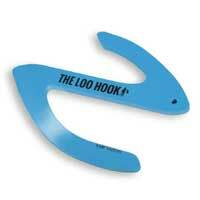 The Loo Hook weighs less than ½ oz. The Loo Hook measures 4″ tall. 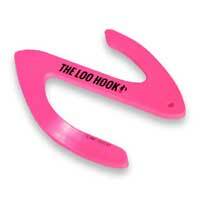 The Loo Hook is available in pink and blue. Buy 2 Loo Hooks and save 15%!